Hay fever season can turn allergy sufferers into plant haters. While it is true that many flowers, especially those in the Aster (Asteraceae) family and those that are pollinated by the wind, can bring on an onslaught of symptoms, there are still many, many flowers that should not cause you any sniffles. Some of the most fragrant garden plants, which you would immediately suspect as being hay fever triggers, are not allergens at all. Flowers like camellias, lilies, and roses, do not have pollen that is dispersed by the wind and they generally do not affect people with hay fever. Of course, there are more and more garden plants that are mainly grown for their foliage, With the flowers removed, these plants will not offend anyone. Azaleas are dependent on insects for pollination. They rarely release it to the wind. 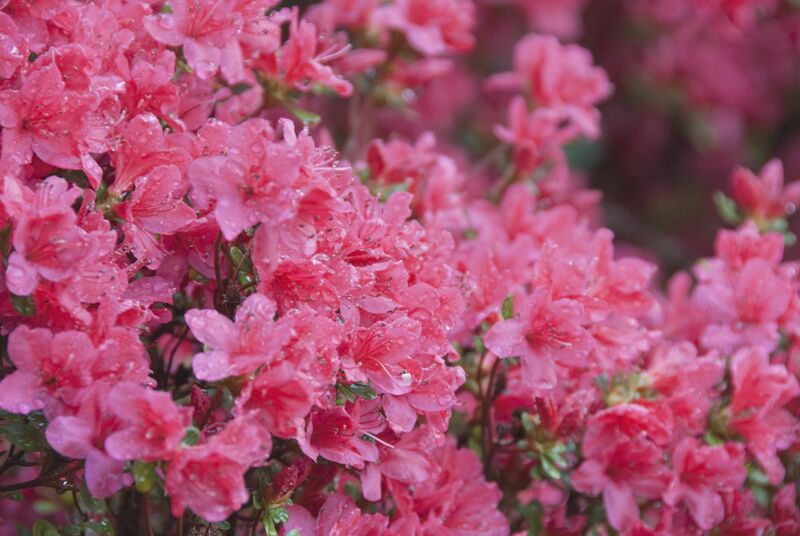 Although they are not allergens, all parts of azalea plants are poisonous to humans, and that includes their pollen. It wouldn't be wise to sniff, an azalea bloom too closely. Thank goodness begonias tend to shed little pollen since these free-flowering plants are in just about every shady garden. All popular types of begonias are safe bets for allergy sufferers. The beautiful "flowers" of the bougainvillea plant are the bracts surrounding the flowers. The true tiny, tubular white flowers are inside the colorful bracts and produce very little pollen. You might not think of cactus plants as having flowers, but they do. Cactus require cross-pollination from another cactus plant to produce viable seed, but they do not rely on the wind to disperse it. Insects and birds take care of that for them. Camellias have a fragrance as lovely as their flowers. You might suspect them of being allergy-inducing plants, but camellias are dioecious, meaning they have both the male and female reproductive organs on the same flower. So their pollen does not have to travel far for pollination. Most clematis vines do not irritate people with hay fever, except for the North American native Virgin's-Bower (Clematis viticella) and Sweet Autumn Virgin's-Bower (Clematis terniflora). Coleus plants add so much color to the garden with their leaves that most gardeners pinch off the flowers before they bloom. This will give you a thicker, lusher plant and no allergy trigger. Although the brush-like stamens of the columbine flower look like they could explode with pollen, these plants rely on nectar-loving birds and insects who dive into their flipped back spurs in search of sweet nectar, to brush up against their stamens and carry the pollen to the pistil, for pollination. Geraniums (Pelargonium) give off very little pollen. Scientists have even developed a pollen-free geranium, although it is not in wide-spread distribution, yet. They may not cause sneezing, but some people do get skin irritation from touching the leaves. Hibiscus flowers produce very heavy pollen, which is not airborne. However, people with hay fever should use caution drinking hibiscus tea, which is made with the flowers and can still contain the pollen. Hosta plants are workhorses in the garden. Gardeners love them because they require so little care. Since the flowers are usually cut off before they bloom, there is no problem with allergies. Hydrangeas are still being studied for their relationship to allergies. Most are not irritants, especially modern cultivars. However sensitive people might want to avoid Pee Gee Hydrangeas (Hydrangea paniculata) and Oak Leaf Hydrangea (Hydrangea quercifolia). The pollen particles of impatiens are large and sticky, perfect for visiting insects to carry to the next flower, but too heavy to be picked up by the wind. Iris do not depend on the wind. The sloping sepals of the iris flower are perfectly designed to lure bumblebees deep inside the flower, where they feast on nectar while rubbing up against the sticky pollen and carry it off to the next flower. While lilies have a good amount of pollen, it is very easy to remove the stamens and the pollen-laden anthers with them. Be careful, because the yellow pollen can stain clothes and fingers. Even worse, the stems can exude a sap that causes skin irritation in sensitive people. Orchid pollen does not often trigger allergic reactions, although some very sensitive people may experience hay fever, especially if the plant is indoors. More likely, skin irritations from the sap some orchids exude can occur. Petunias give off a faint scent that becomes much more pronounced when the plants are grown en masse. However, their pollen is not considered an allergen. Phlox pollen is not airborne, and the plants are often suggested as an alternative to mums, for some late-season color without the irritation so often caused by mums and its cousins in the Aster family. Although rose pollen can be airborne, most roses do not trigger hay fever. Roses with dense petals release less pollen than single flowers. The worst culprits seem to be wild roses. Snapdragons are a great choice for both spring and fall gardens. The snapped shut flower that bees love to squeeze their way inside of tends to keep its pollen contained. Most spring bulbs are self-pollinating. Although their pollen can become airborne, the flowers tend to be very low in pollen. This includes some of the most popular spring bloomers, including crocus, daffodils, hyacinth, and tulips. The cheery globes of Thrift's (Ameria maritima) pink or white flowers rely on bees for pollination and should not cause hay fever sufferers any distress. Verbena plants are suggested for attracting more pollinators to your garden. Although they are rich in nectar and pollen, the pollen does not travel on the wind and should not affect people with hay fever. The thick, sticky pollen of members of the viola family, including pansies, it too heavy to be caught up in the wind. These plants do not contribute to hay fever. Although zinnias are part of the Aster family that contains so many plants that trigger hay fever, the newer hybrids do not appear to cause problems, for most people. These are certainly not the only flowers that won't cause hay fever problems, but they will help you get an allergy-free garden started. What Is a Half-Hardy Annual?